© Posted on January 23, 2018, by Michael E. Newton. 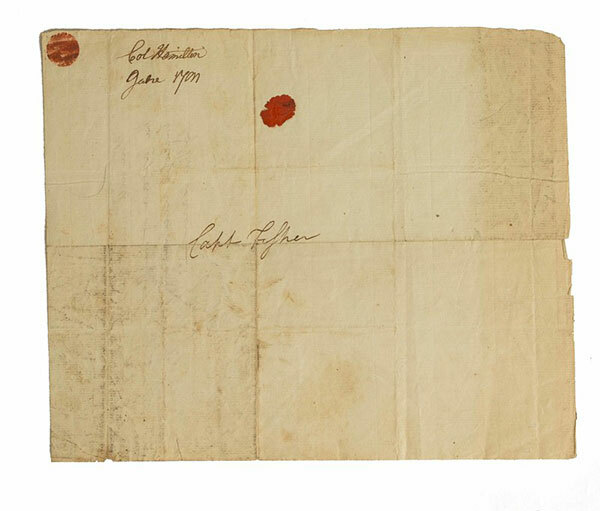 Tomorrow (January 24, 2018), Witherell’s auction house will be auctioning an Alexander Hamilton letter previously unknown to the public. A fascinating but little known fact is that Hamilton was promoted to Colonel by an act of Congress in 1783. The commission was granted in recognition of his extraordinary service to the nascent United States of America. 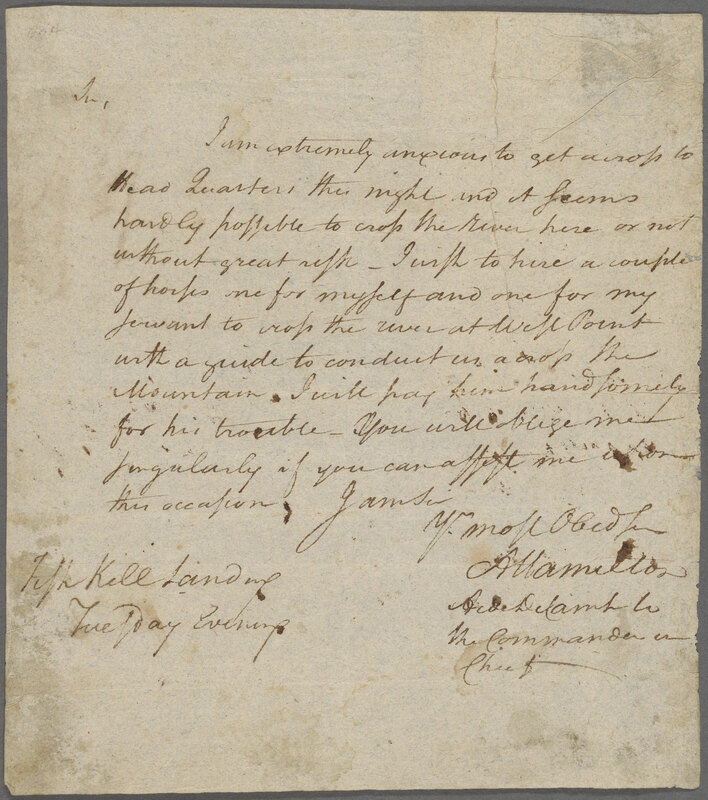 The promotion was short-lived, just three months in length, but this letter, currently offered by Witherell’s, was written by Hamilton in that time period. 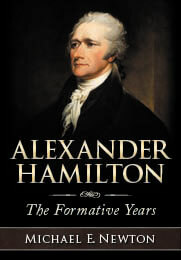 At the time of its writing, Hamilton was likely practicing law in New York City and Albany, New York. He specialized in defending Tories and British subjects, as in Rutgers v. Waddington, in which he defeated a claim for damages done to a brewery by the Englishmen who held it during the military occupation of New York. When in Albany, Alexander Hamilton and his wife, Elizabeth Schuyler Hamilton, resided at the Philip Schulyer Mansion on Catherine Street, the same home in which they were married. Hamilton worked from the library in this historic mansion. Was this letter written there, at his law office at 12 Garden Street in New York City (now Exchange Place in the center of the Financial District) or in a carriage while traveling between these two cities? 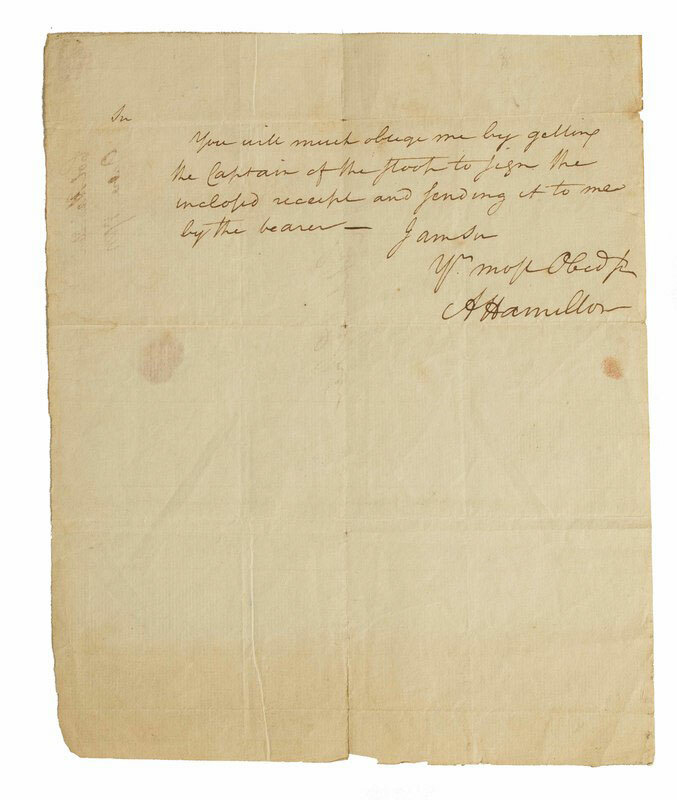 We will never know for certain, but now you have a chance to own a piece of this history through the purchase of this authenticated letter written and signed by Alexander Hamilton. With some help from Mariana Oller, Associate Curator of Special Collections at Wellesley College and Chair of the Alexander Hamilton Awareness Society, and Douglas Hamilton, Alexander Hamilton’s fifth great grandson, I have uncovered more information about this Hamilton letter. As seen in the above images, this letter was sent by Alexander Hamilton to a “Capt Fisher.” In all his known correspondence, Alexander Hamilton sent just one letter to a Fisher, a January 9, 1781, letter to George Fisher. Fortunately for us, a digital copy of the letter is available on the New York Public Library’s website. One notices that Alexander Hamilton did not address the above letter to George Fisher. 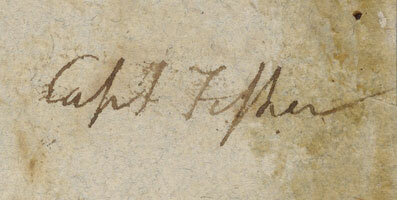 Rather, he addressed it to “Capt Fisher,” just as he addressed the other letter. Just as the letter of January 9, 1781, had been sent to Capt. George Fisher, Hamilton must have sent this previously unknown letter to the same person. 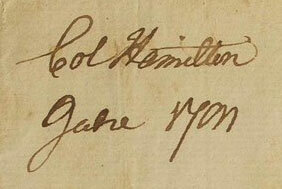 Unfortunately, the date scribbled down on this previously unknown Hamilton letter is rather messy. Upon close examination and in comparison to other Hamilton letters, it is clear that the month written on this letter is June. The “u” and “n” do not look like Hamilton’s normal way of writing those letters and in fact look more like an “a” followed by some sort of slip, but the word clearly starts with a “J” and ends with an “e,” leaving June as the only possibility. Turning to the year, it helps to compare the date of this letter to the date written on Hamilton’s letter to George Fisher of January 9, 1781. One notices that the years written in both letters, despite being rather messy, are quite similar. But what are they? It helps to know that in the style of the time the digits of a number were commonly connected and that an “8” was sometimes written at an angle or nearly sideways. Bearing this in mind, the years written on the two letters both look like 1781, certainly more like 1781 than any other possibility. 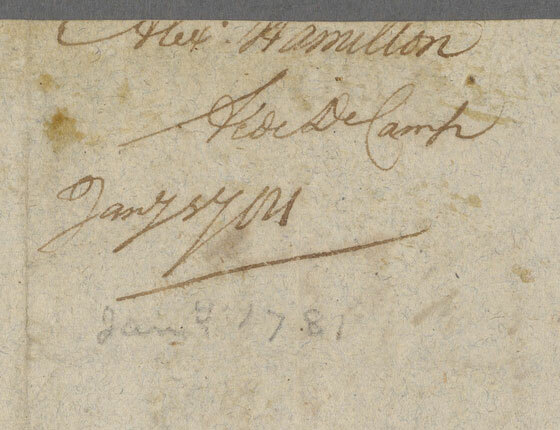 Lending support to the conclusion that this letter was penned in June 1781, Alexander Hamilton did not write “Aide De Camp” in his signature or on the back of the letter as he did in his January 1781 letter to George Fisher. This suggests that Hamilton wrote this letter after he resigned as Washington’s aide at the end of April 1781. (This, however, is not decisive since Hamilton didn’t always write Aide De Camp, especially on private letters.) Additional support is provided by the fact that Hamilton was in Fishkill in June 1781, when he would have written this letter to George Fisher of Fishkill. Given all the evidence, it is clear that this previously unknown letter now up for auction was written by Alexander Hamilton to George Fisher of Fishkill in June 1781. Assuming that the above is correct and this letter was written in June 1781, one must address the idea proposed in Witherell’s blog that this letter was written when Hamilton was a Colonel, i.e., in early 1783, because he wrote “Col Hamilton” on the back of his letter. In 1781, Alexander Hamilton was a Lieutenant Colonel, not a full Colonel. However, it was standard practice to address Lieutenant Colonels as Colonels. 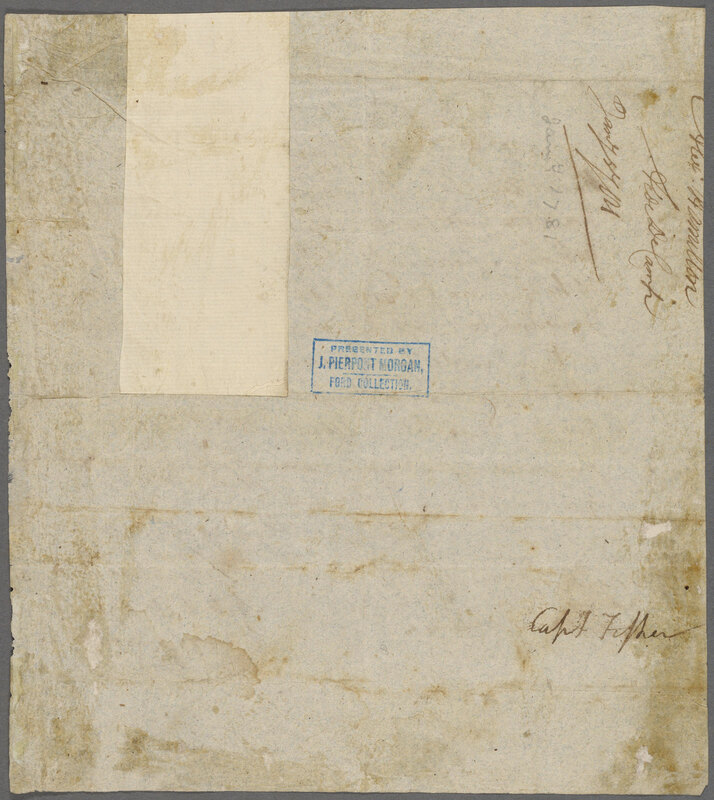 Thus, the “Col Hamilton” on the back of the letter does not mean that Hamilton was a full Colonel at the time this letter was written. Previous Previous post: Where Did Alexander Hamilton Live While Attending Grammar School in Elizabethtown, New Jersey?